Spray Robots are relatively new to the industry of single and plural component application. SprayWorks Equipment has developed automatic spray machines to simply material application and create precise accuracy within a few mils. Our spray robots are designed to work with a small two-person crew. What kind of automatic spray machines are available? 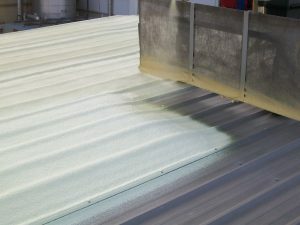 The original Spraybot was designed with the commercial roofing industry in mind – but quickly expanded to all flat substrates with Open Cell Foam, Closed Cell Foam, and Polyurea. It’s 62″ wide pass, allows a consistent spray with adjustable gun he8ight from 12-36″. Read more about the Spraybot. The new Coaterbot, release in 2019, was designed as a result of industry need. The Coaterbot is the only precision coatings and spray foam applicator in one. With an end-pass rotation, the Coaterbot is ideal for a variety of applications including; foam, coatings, Polyurea, Roof CTG, Floor CTG, Primary & Secondary Containment. Read more about the Coaterbot. Why Should You Consider Automatic Spray Robots?